One evening after dinner, Richard spies a strange, white deer in the fading light of the woods. It leaps away into the thick brush, but Richard is certain of what he’s seen: a unicorn. And Heather–out for a ride–has also spotted the unusual stag. Heather and Richard cannot agree on what they’ve seen. They definitely do not want to share their secret. But they will soon discover that their assistance is much-needed indeed. First published in 1975, The Transfigured Hart by Jane Yolen is getting a new edition thanks to Tachyon Publications. It remains an enchanting tale about the power of belief and the importance of trust. The novella sits squarely in mythopoeic tradition, in that liminal space where it’s never quite clear what’s fantasy and what’s reality. The two children have very different ideas about the creature they spied in the woods: for Richard it’s a unicorn, whereas Heather is certain it’s an albino stag. And even though some of the story is told from the perspective of the creature, this doesn’t settle the issue. Nor is it supposed to; it’s the sort of story that allows space for the reader’s interpretation. Told in third person, it alternates between the focusing on the creature, Richard and Heather. Although nominally a middle-grade novel, it makes no effort to dumb down the language–rather to the contrary, in fact. Having been a precocious reader, I really appreciated this. The sentence structures were somewhat simplistic to begin with, but this is less about talking down to the audience than it is about invoking a fairytale atmosphere. Having been written more than 40 years ago, one might expect the story to be a bit dated. And in one or two places it is. For example, Heather is required by her parents to leave a note on the fridge whenever she goes out. These days, she’d be more likely to have a mobile phone and send a text message. However, much of the action takes place in the forest, which gives it that fairytale sense of timelessness. The story should come with a content warning for animal death… although probably not the one you’d expect. And, as with many unicorn stories, there’s also a subtextual theme of sexual awakening. However, this is very underplayed (being mostly down to the symbolism) and is likely to bypass most young readers (and probably more than a few adults). 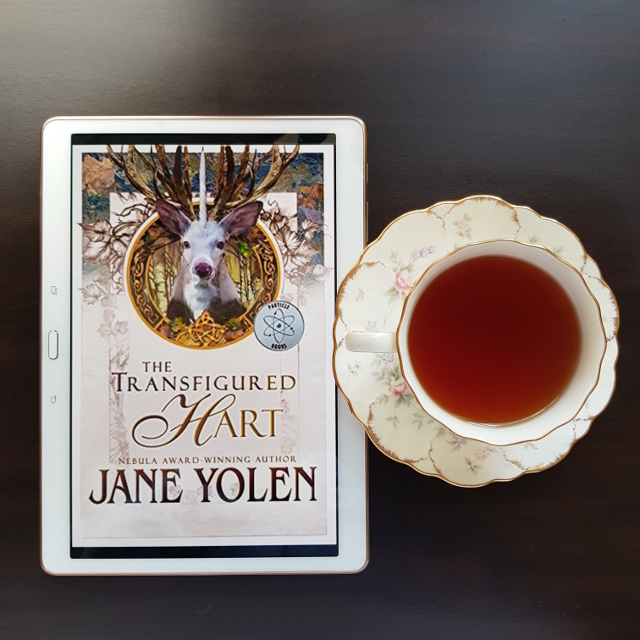 All in all, The Transfigured Hart is a delightful read that shows why Jane Yolen is a master of fantasy.